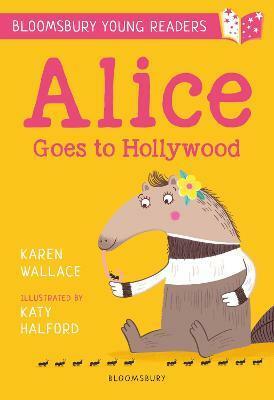 Alice the anteater has a dream - she's going to be a film star! So she finds herself a pair of high-heeled sandals, a frilly satin dress and some film-star sunglasses and sets off for Hollywood. Soon Alice is the talk of the town, but there's just one problem - will she ever get to star in a film? This dreamy and glamorous tale from award-winning author Karen Wallace is perfect for children who are learning to read by themselves and for Key Stage 1. It features engaging illustrations from Katy Halford, and quirky characters young readers will find hard to resist. Karen Wallace is an award-winning author of children's books for all ages. Her Goose Pimple Bay Sagas was a World Book Day recommended read in 2008 and Li Fu's Great Aim was chosen for the 2008 Boys into Books Promotion. Karen has also created the popular Alice the Anteater books. Katy Halford is from Leicestershire, and can't remember a time before she loved to draw. As a child she would create paper houses and shops and would play for hours in these imaginary worlds, creating little stories and acting them out. She went on to graduate at Loughborough University with a degree in Illustration. Katy is fascinated by people and animals and turning them into characters. She loves to add patterns and details to clothing, fun hairstyles, hats, glasses and lots of other accessories!